Hans Ni (Beijing iSpatial Co., Ltd) represented FIG at the 20th Chintergeo which has grown to be one of the most important exhibitions. Hans Ni (Beijing iSpatial Co., Ltd) represented FIG at the 20th Chintergeo which has grown to be one of the most important exhibitions. 340 exhibitors including manufacturers, solution providers, distributors and vendors as well as media companies found their way to the 20th ChinterGEO and showcased their latest productions, solutions and services within the 20000 square meter exhibition area. Nearly 26000 professional visitors participated the event. The exhibitors are not only large Chinese enterprises within the industry, but also small and medium size companies such as accessories manufacturers. In addition, several international companies with Lidar, UAV, SAR emerging technologies participated the fair as exhibitor. 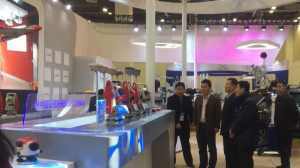 All exhibitors showed their technologies and capabilities and released new products in the fair platform. 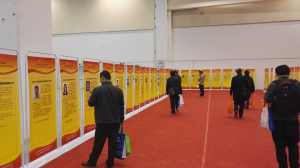 The fair was well-organized and filled with an easy atmosphere with various forms of interaction including exhibition, new product release and announcements, as well as high-end forums. ChinterGEO main forum swas moderated by Mr. Liang Chen, CEO of RedChina Geosystems Group. Representatives from the GNSS & LBS Association of China, The China Association for Geographic Information Society, and the ISPRS addressed the forum. The 5 keynote speakers were Mr. Chao Ma (president of South Survey Group, titled with How to transfer from sales of surveying equipment to providing geo-service), Mr. Haihui Huang (Vice president of Beijing Unistrong, entitled with Creating win-win Geospatial ecological system), Mr. George Zhao (president of Huace, entitled with Applications of high accurate Beidou products), Mr. Yongquan Wang (president of Comnav, entitled with Pioneering new applications of Beidou products in professional market) and Mr. Hans Ni (President of Beijing iSpatial, entitled with From Intergeo to ChinterGEO). 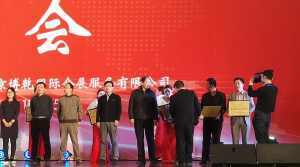 Five sub-forums including Laser scanning and BIM, UAV photogrammetry, Beidou Applications, Structure Monitoring and Indoor Positioning were held in parallel sessions and organized by South Survey Group, RedChina Geosystems Group, ComNav Technology Ltd, Beijing iSpatial Co., Ltd and Beijing Outsmating Roctec Technology Co., Ltd respectively. 30 experts presented the latest technologies and trends in specialized markets, which gave audiences a perspective overview of the industry. Distributors, dealers and vendors are very important component of ChinterGEO and critical power to promote the industry. With recommendation by manufactures and internet voting, the awards for the TOP 100 excellent dealers in the industry were awarded. For ChinterGEO, it is time to bring the fair in line with international practice and push a deep-in cooperation with international society. It is time to look beyond EAST and WEST. 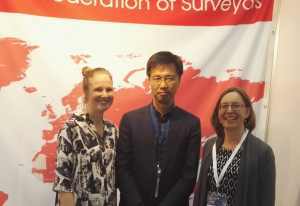 Mr Hans Ni, Beijing iSpatial Co., Ltd, represented FIG at ChinterGEO. Here he is visiting the FIG stand and FIG office at InterGeo in Hamburg, Germany.